Prof. Dr.-Ing. 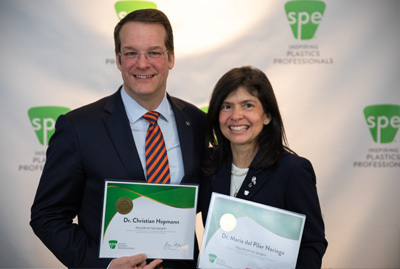 Christian Hopmann and Dr. Maria del Pilar Noriega - Head of the ICIPC, in Medellin, Colombia, received the prestigious award of the Society of Plastics Engineers. At ANTEC 2019, the largest international technology conference, the newest "Fellows of SPE" were honoured. Among them was Professor Christian Hopmann, who received the prestigious award of the Society of Plastics Engineers (SPE) on March 17 at the Renaissance Center in Detroit, Michigan, USA. The "Fellows of the Society" are selected individuals who have reached outstanding achievements in science, technology or management in the field of plastics technology. Only 319 members, including the new Fellows, have been awarded this prestigious title since it was introduced in 1984. Candidates are nominated by one of the SPE's Technical Divisions and selected by the Fellows Election Committee. Professor Hopmann was nominated and honoured by the Injection Moulding Division (IMD). The staff of the IKV are pleased with him and congratulate him warmly. The IKV also warmly congratulates Dr. Maria del Pilar Noriega. She has been awarded the SPE fellowship of the Extrusion Division. Maria del Pilar Noriega is general director of the Instituto de Capacitación e Investigación del Plástico y del Caucho, ICIPC, in Medellin, Columbia. IKV and ICIPC are connected by a longstanding partnership and close friendship.